Saturday, Oct. 5, 9:00 to noon at the Grange Hall, West Tisbury. The last weekly market of the season! Fresh picked produce from local farms, flowers, delicious baked goods and prepared foods from Island kitchens and more. Saturday, Oct. 5, 2:00 to 4:00 pm at the Polly Hill Arboretum. Marlene Snecinski, aka Mushroom Marlene, leads a walk foraging for wild mushrooms and other fall botanicals. She will also discuss Mycophagy, the practice of preparing and eating wild fungus. $25 ($20 for PHA members), pre-registration required, (508) 693-9426. Saturday, Oct 12, 9:00 am to 2:00 pm, Oak Bluffs. Many electronic devices and appliances contain toxic chemicals that can be harmful if not disposed of properly, not to mention that getting rid of them at the dump is expensive! Free yourself of burdensome junk at MV Community Services, across the street from the high school. Fees range from $1 - $30 and benefit MVCS. Price list and general info here, or call (508) 693-7900 ext. 229. Sunday, Oct 13, 10:00 am to 3:00 pm, Oak Bluffs. Food, workshops and harvest activities at the Community Solar Greenhouse on New York avenue in Oak Bluffs. Free, call (508) 696-0305..
Thursday, Oct 17, 4:30 to 7:45 pm, Oak Bluffs Library. Program explores the world of marine and paleobiological research. Free. Call (508) 693-3122. Saturday, Oct. 5: Two experienced Island ornithologists offer to share their expertise. 9:00 am: Robert Culbert leads tours of various birding hotspots. Meet at the high school parking lot to carpool, $30, $15 under 18. For more info call (508) 560-5294. Outdoor preschool for children up to six years old with parent. Starting Oct. 11. Weekend children's programs for ages 6 to 14. Starting Oct. 6. Adventure, fun and quality outdoor time for the entire family. For more information on these and other programs, including pricing and registration, call (508) 645-2008. This idea for creating a storable snack with the late-season tomato harvest comes from Jack Bishop of America's Test Kitchen (interview here). This works best with a meatier variety such as a plum/sauce tomato, but will just take a little longer with juicier varieties. Preheat the oven to 425F. Set up a wire cooling rack on top of a baking sheet. Cut the tomatoes into chunks (halves for plums) and toss them with olive oil, salt and pepper (and other herbs if desired). Then place them cut-side-down on the rack and into the oven. After 20 to 30 minutes the skin will have blistered. Remove the tomatoes, turn off the oven, and peel the skin off. Then return them to the oven, now set at 300F, to dry them out. It should take 3-4 hours; they're done when shriveled with brown edges. These can be stored dry for snacks, or covered in olive oil for a salad and sandwich topping. They should keep about three weeks in the fridge. 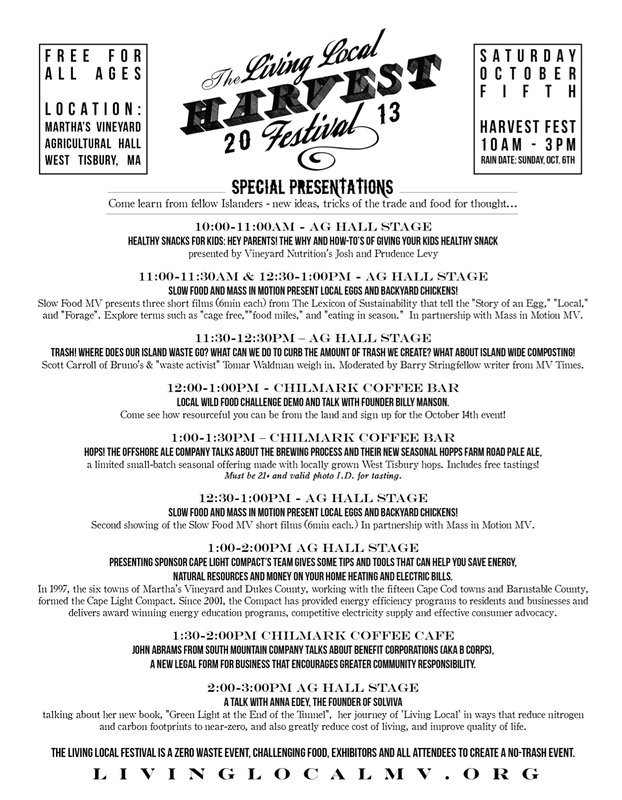 Join your friends Saturday, Oct. 5 from 10:00 am to 3:00 pm at the Ag Hall in West Tisbury for Living Local 2013. Founded by four Island organizations -- the M.V. 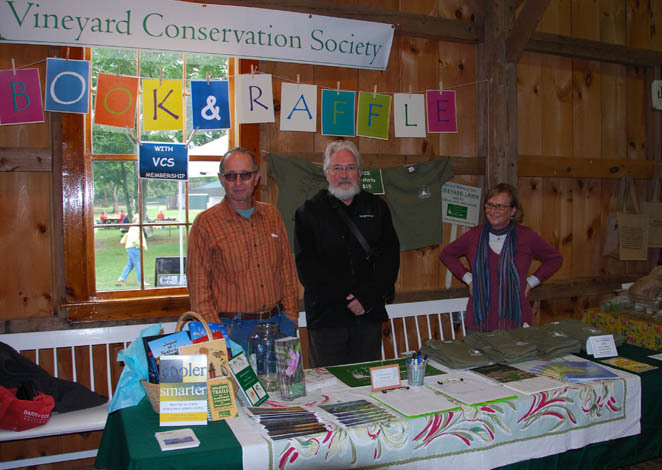 Ag Society, Island Grown Initiative, Vineyard Energy Project, and the Vineyard Conservation Society -- the annual harvest festival has become a community tradition. As always, this year's event will feature fun and games, and lots of learning: local and sustainable approaches to food production, protection of marine life, renewable energy, resource conservation, economic development and more. A full schedule of the special presentations can be found here. Stay late for a community potluck (from 6 to 10 pm). Also, on Friday night (the 4th) from 6 to 9 there will be a special storytelling event at the Grange Hall moderated by Susan Klein. Congratulations to the Land Bank on their finalization of the purchase of Flat Point Farm, and also to the Fischer family, long-time owners who have worked tirelessly over the past year to help steer the property into permanent conservation status. 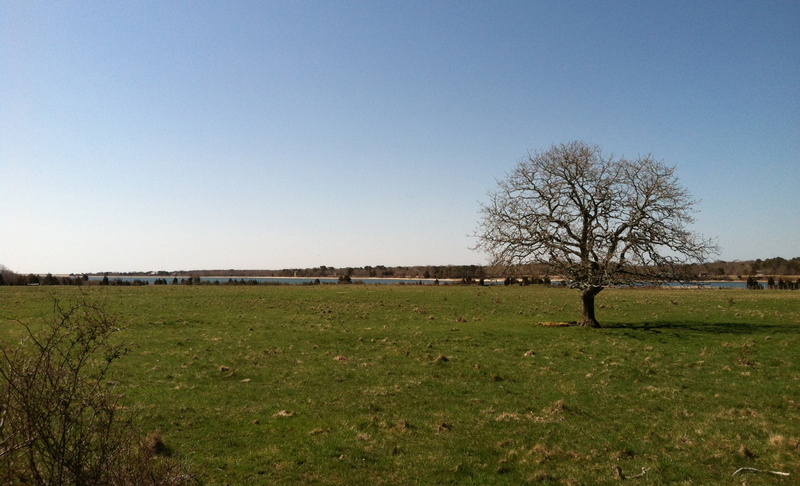 Saved at the last minute from a likely fate of residential development, this parcel located right on Tisbury Great Pond will instead retain its agricultural use, and also feature public walking trails (once they are completed). For more on the background of the transaction, see the spring issue of the VCS newsletter (page 8). Overkill: This Garage Protected by W.M.D. Many of the most popular rodent poisons available today, including products made by d-Con, Hot Shot, Generation, Talon, and Havoc, contain what are known as “second-generation” rodenticides. While they operate in a similar fashion to the older chemicals, the new products are much more toxic to non-target animals. Wildlife, especially predators, are most at risk because slow and non-vigilant prey animals suffering the early effects of the poison make tempting targets. Inside the home, small children are at risk of eating the poison directly, and pets face both types of threats. An excellent outline of the problem is found at Audubon Magazine, along with an interesting if rather morbid account of the use of 2nd-gen poisons as “weapons of mass destruction” to completely clear rat-infested islands for the purpose of ecological restoration. One takeaway message is that if you must use poisons to control rodents, the older chemicals (chlorophacinone, diphacinone, diphacinone sodium salt, warfarin, and warfarin sodium salt) are actually much safer. But a better alternative is to avoid chemicals altogether, with equally effective yet more focused solutions including snap traps, humane catch-and-release traps, and the traditional domestic predator, Felis catus. Strange Patterns in the Jet Stream: Another Case of Global Weirding? So far, 2013 has seen an unusually large amount of severe weather events. Severe flooding, wildfires, and heat waves have dominated news coverage this year, leading to many questions about what could be behind it. One explanation is that a particularly unstable polar jet stream is to blame: the fast-moving atmospheric air current that drives the weather we experience on the surface has been shifting around rapidly this year, even splitting in two for several months. In the long run, decade-to-decade changes in frequency of severe weather events is (and will be) the result of ongoing global climate change. In the short run, though, radical changes in the jet stream such as those seen this year are a more direct explanation for specific weather events. Of course, for those who seek to minimize the importance of preparing for (or doing anything to reduce) climate change, this will surely be an opportunity to argue that, if jet stream oddities are to blame for increases in severe weather, then climate change doesn't matter at all. Apart from being an oversimplification, one might wonder: What could cause long-term, persistent changes in the jet stream? For now, there is no scientific evidence that climate change is behind this year’s unusual jet stream behavior. But don’t be surprised if in 10 years there is: currently, it’s a hunch, a plausible explanation (really, the most plausible one) that lacks experimental evidence because the work hasn’t been done. What we do know is that the jet stream is, on a fundamental level, a product of the Earth’s climate; changes in the climate would surely affect it at least somewhat.